Girls in an Egyptian school wear hijabs and are separated from the boys. During Mubarak's authoritarian regime, Islamist ideology replaced the previous patriotic narrative in the country's school curricula. Students were taught that Islam was the only true religion and that followers of other religions were "infidels." In contrast to the widespread perception of the Mubarak regime (1981-2011) as modernist and largely secular, school textbooks of Egyptian history during his reign systematically watered down the narrative grounding the country's national identity in patriotic struggle against foreign invaders (Rome, Byzantium, Crusaders, Ottomans, Britain, Israel). Instead, Islam became the basis of Egypt's national identity with students taught that it was the only true religion, that followers of other religions were "infidels," and that "jihad in the path of God" was a holy and supreme value. It is hardly surprising, therefore, that the autocrat's 2011 downfall led not to a democratic "spring" but to an Islamist surge. The substitution of faith for the millenarian anti-invader resistance as the core principle of Egyptian national identity is strikingly demonstrated at the "October War Panorama." This huge Cairo museum, inaugurated on the sixteenth anniversary of the October 1973 war to extol Egypt's alleged victory over Israel during that conflict, has become a major pilgrimage site for Egyptian pupils. There they are taught that the astounding opening gambit of the war—"the crossing of the most difficult water barrier in the world" (i.e., the Suez Canal) and the destruction of Israel's defensive line on its eastern bank—was due not mainly to the brilliance and courage of the Egyptian armed forces but "to our strong belief in God." This deep religiosity among the Egyptians has created for them an honorable place in the history of the heavenly religions. For it was upon its land that Moses propagated Judaism; the Virgin Mary sought asylum there with her son, Jesus; and the Egyptians embraced Christianity and offered many martyrs to the cause of their belief in it. inaugurated a new era known for its justice and equality, religious tolerance, and respect for other religions, during which Muslim Egyptians and Christian Egyptians lived [together] in one country, and love and friendship reigned between them, and each one of them desired to love the other. the Prophet urged his nation to take care of the Copts of Egypt ... 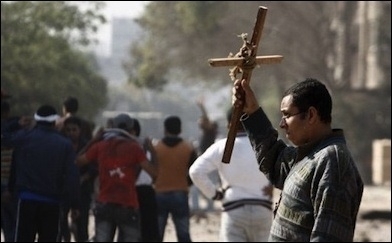 He said: "Have the best intentions toward the Copts, for they have protection and kinship [rights]." The Prophet has left this commandment as a legacy after him, to be followed by the Muslims. the only Arab state whose people were not torn apart by religious and ethnic bigotry, after Muslims and Copts became united, and the bloodshed by English bullets [during the 1919 uprising, widely considered the first national revolution in modern Egyptian history] joined them together. They adopted a flag on which there was a crescent and within it a cross. Recent attacks against Egypt's Copts and Copt-owned businesses as well as arrests of Christians on alleged charges of desecrating the Qur'an present a stark contrast to the idyllic picture painted by the authorities on Muslim-Christian relations. The Copts have suffered sustained persecution and discrimination in Egypt, a fact widely whitewashed in Egyptian schoolbooks. Reality, however, was quite different. In stark contrast to this idyllic picture, not only have the Copts suffered sustained persecution and discrimination at the hands of their Muslim rulers (a fact widely whitewashed in Egyptian schoolbooks), but Islam's overwhelming centrality to Egypt's national identity has been conveyed in the school textbooks by stressing the religion's superiority over other religions, notably the People of the Book: the Christians and the Jews. Both the Torah and the Gospels have been portrayed as distorted scriptures whose followers are infidels—"those who have gone astray"—and are destined for hell, and hypocrites: "the assistants of the Jews and pagans, but more dangerous since they are outwardly believers, but inwardly infidels. Therefore, the Muslims must beware them." In short, while paying lip service to the idea of "religion," it is Islam that constitutes the basis of Egyptian national identity. One lesson stresses "the love of the homeland derived from faith." This faith is Islam. We shall protect thy soil and routes / Chanting of victory for the believers. The objective of this lesson is to stress "the love of the homeland derived from faith." This faith is Islam, despite the fact that the lesson is about citizenship. By contrast, Egypt's national anthem does not refer to religion or Islam, apart from stating "on God I rely." By way of ameliorating Islam's overwhelming centrality for Egypt's national identity, in the early 2000s the Ministry of Education embarked on an ambitious educational effort to alert students to "the problems of [their] environment and [to the need] to work for their solution, instilling the correct religious values away from extremism and terrorism, so that everyone will live in peace and security." helping the students to understand Islamic perception of theology, the universe, man, and life, a perception that will preserve their human distinctiveness and the distinctiveness of their society, and protect them from addiction, extremism, violence, and from other types of deviance ... Creating a human being who rejects ... fanaticism, extremism, and everything that tears down the pillars of social structure. helping the students to deepen their Islamic perception ... as well as emphasizing the belief in the divine mystery and the importance of jihad in God's cause. This perception is the one that will preserve their human distinctiveness ... and will protect them against slipping into harmful conduct such as extremism, violence, addiction, and other types of deviance. This educational effort came to little avail. Not only did it fail to curb fanaticism, extremism, and violence, but it strengthened the view that Islam, "the only true religion," was indeed the beginning and end of Egyptian national identity. The Mubarak regime did try to reform textbooks in 2010, a few months before its downfall. However, Egypt's mufti Ali Gum'a (above) emphasized al- Azhar's exclusive responsibility for formulating the new curricula and indicated that "a new textbook, titled Morals, would be compiled and introduced in all grades." The textbook has not yet been issued. The regime tried again to reform textbooks in 2010, a few months before its downfall. 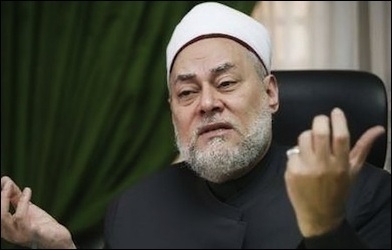 On April 26, 2010, in a joint press conference with Egypt's mufti Ali Gum'a, Minister of Education Ahmad Zaki Badr announced a revision of religious studies in all grades with a view to "purging the curricula of erroneous interpretations and materials inciting to violence and extremism" and inculcating "moral values independently of religious ones." Not surprisingly, the mufti did not seem to share Badr's wish to teach moral values independent of religious ones. Rather, Gum'a proclaimed that "the current curricula were not fundamentally flawed, but only needed to be updated and adjusted to the spirit of the era." In this spirit, he announced that "a new textbook, titled 'Morals' would be compiled and introduced in all grades, to inculcate the values of tolerance shared by all monotheistic religions." Several days later, the mufti emphasized al-Azhar's exclusive responsibility for formulating the new curricula that "will consolidate the pupils' understanding of pluralism, and teach them to respect those with different faiths, color, gender, or languages." Education ministry sources reported that the main changes to be made in the curricula involved "the elimination of all Qur'an verses calling to jihad or the killing of polytheists" and clarified that the revision would be carried out in cooperation with both al-Azhar and the Dar al-Ifta educational institute. The announcement of this reform sparked both vehement opposition and enthusiastic support. Ahmad Gabili, head of the People's Party, claimed that the reform program could "undermine the Arab and Islamic identity of Egypt's curricula" and that it was a corollary of an U.S. plan to dry up the ideological sources of terror. Ibrahim Jafari, a member of the Muslim Brotherhood bloc in parliament, said that the reform program violated article 131 of Egypt's Education Law stipulating that special research centers were to have exclusive responsibility for amending curricula. Abdel Latif Fayed, an editor of al-Jumhuryia newspaper, opposed the reform on the grounds that "the teaching of moral values and the teaching of religion are inseparable, and both are anchored in Islam." We must stop teaching our children anything that maligns the Christian faith and even the Jewish faith. We must carefully pick out the Qur'an verses that stress the values of coexistence, mutual brotherhood, and cooperation among people, and those that stress the individual's freedom to choose his faith, free from any kind of coercion. ... The [custom of] applying the term "infidel" to the followers of other faiths must be stopped, once and for all. This epithet is very dangerous, and constitutes a license to kill [the members of other faiths]. The use of epithets such as "unbelievers, infidels, and hypocrites" in reference to other religions has not stopped. The Mubarak regime managed to carry out part of this reform, notably by excising the phrase, "emphasizing the belief in the divine mystery and the importance of jihad in God's cause," from the introduction of a book of Islamic education. Sacrifice oneself for God's cause. Know the character of the Jews. Sum up the character of the Muslim society. Draw an analogy between the contemporary ways of Jews and those in the past. The unit further explains: "We learn from this that the Jews do not keep their treaties, as they had betrayed God and his Prophet before, thus God took vengeance upon them. This is how they are all the time." It further recommends that instructors, "Ask your students to use the computer and gather the Qur'anic verses that deal with the treachery of the Jews." To achieve these goals, the unit offers some multiple choice exercises including: "One of the characteristics of the Jews: (Truthfulness, treachery, loyalty)," and information: "It is in the nature of the Jews to destroy their houses before they leave." Moreover the new schoolbook on "morals," which aimed at instilling the values of tolerance shared by all monotheistic religions, was never issued. Was it because difficulties were encountered in devising its content, specifically the reluctance to place Islam on a par with the other monotheistic religions? Or rather because an increasing number of Egyptians were aware, almost a century ago, that the common denominator between all Egyptians was not religion but Egyptian nationalism. The solution was to be found in a genuine civic constitution for which the nation is the source of authority and power and which sanctions "the principles of equality of rights and duties for all Egyptians and the principle of respecting the liberties of all." Egypt is a deeply religious society, and that it is inevitable that Islam will have a place in our democratic political order. While religion cannot be completely separable from politics, we can ensure it is not abused for political gain. I can assure that the religious establishment is committed to the belief that government must be based on popular sovereignty. Acknowledgement of a nation's religious heritage is an issue of national identity and need not interfere with the civil nature of its political process. ... the Egyptian interim constitution ... guarantees equal citizenship before the law regardless of religion, race, or creed. President Sisi has also taken some steps to curb violence and extremism and address the increase in sexual harassment displayed during mass gatherings. He ordered the abolition of "Islamic Education" in the school curriculum and its replacement with the new subject area entitled "Values and Ethics." It remains to be seen whether and to what extent this decision (and for that matter, the "religious revolution" announced by the Egyptian president) will be implemented. But any assurances sound both unconvincing and unreliable in view of the violent anti-Copt outbursts during the revolution and after the collapse of the Mubarak regime. Since early 2011, some 93,000 Copts have fled Egypt, underscoring their lack of confidence in Egypt's future—not merely because of the mass violence but because of the way it was handled by the new government. There was unanimous condemnation but also striking passivity by both police and army. No steps were taken against rioters; no one was brought to justice, and there was widespread reaffirmation of the notion that Muslims could not be ruled by non-Muslims. These curricula reflect the oxymoronic ideals, taught for decades in Egyptian schools, that religion is the basis of national identity but at the same time, Christians and others are infidels. Post-Mubarak administrations are left to grapple with this Islamist bias in Egyptian textbooks. In doing so, Egyptian governments should draw lessons from these failed attempts at curbing intolerance and extremism by relying on religion. It would be prudent not to mix religion in the crucial and sensitive endeavor of constructing national identity through education. Yohanan Manor is the founder of IMPACT-SE and author of "Anti-Jewish Sentiments and Stereotypes in Arab and Muslim Schoolbooks," in Alan Baker, ed., The Changing Forms of Incitement to Terror and Violence (Jerusalem, 2012). Three in-depth research projects have studied Egyptian educational materials and were used by the author. First is Jews, Christians, War and Peace in Egyptian School Textbooks, issued in March 2004 by IMPACT-SE, the Institute for Monitoring Peace and Cultural Tolerance in School Education. This report surveyed 119 Egyptian schoolbooks used in primary, preparatory, and secondary state schools as well as in the al-Azhar school system. The books were scrutinized according to two sets of criteria, one related to the concept of the "Other" and the second related to peace. Are other peoples, religions, and communities recognized and accepted as equal or are they presented in a stereotyped and prejudicial way? Similarly, does education foster peace or support the peace process? The second is an updated survey of twenty-nine new schoolbooks introduced in the school year 2010-11, carried out by IMPACT-SE in March and April 2011. This study analyzed books using the IMPACT-SE methodology, based upon six applied international educational standards derived from relevant U.N. Educational, Scientific and Cultural Organization resolutions on peace and tolerance in education. According to the first three criteria, school education should support and advocate tolerance, understanding, and respect toward the "Other," nonviolent conflict resolution, and peace and the peace processes. The three other yardsticks oblige schools to provide wording free of prejudices and contempt; accurate, complete, and balanced material; and adequate and objective data on disputes and conflicts. Last is a 1998 report by Wolfram Reiss, which devoted one of its chapters to the portrayal of Christianity in Egyptian schoolbooks. See, for example, at-Tarbiya al-Wataniya: Misr wa-Dawruha al-Hadari (National Education: Egypt and Its Role in Civilization), grade 9, 2002, p. 73. Ali Abdel Mohsen, "Egypt's Museums II: The October War Panorama," Egypt Independent (Cairo), Oct. 6, 2010. At-Tarbiya ad-Diniya al-Islamiya (Islamic Religious Education), grade 5, I, 2010, p. 27; at-Tarbiya al-Wataniya: Misr wa-Dawruha al-Hadari (National Education: Egypt and Its Role in Civilization), grade 9, 2002, p. 44. At-Tarbiya ad-Diniya al-Islamiya, grade 5, I, 2010, pp. 35-6; Misr wa-Hadarat al-Alam al-Qadim (Egypt and the Civilization of the Ancient World), grade 9, 2002, p. 231. Ad-Dirasat al-Ijtimaiya: Jughrafiat al-Alam wa-Tarikh Misr al-Hadith (Social Sciences Geography of the World and Egypt's Modern History), grade 9, part I, 2010, p. 96. Lughatuna al-Jamila: al-Qara wa-l-Nusus (Our Beautiful Language: Reading and Texts), grade 6, I, 2002, pp. 22-4. At-Tarikh li-Thanwiya al-Ama (History for Public High School), grade 11, 2002, p. 216. At-Tarbiya ad-Diniya al-Islamiya, grade 1, part II, 2010, p. 22; idem, grade 1, part I, 2002, p. 1. Ibid., grade 1, part II, 2010, pp. 9-15, 33; idem, grade 5, part II, 2010, p. 33; idem, grade 7, I, 2002, pp. 22, 25; Mubahathat fi Ilm at-Tawhid (an-Nabuwat) (Studies in Theology: Prophecies), al-Azhar, grade 10, 2002, pp. 28-31. This line describes the "common aspiration" for martyrdom. At-Tarbiya ad-Diniya al-Islamiya, grade 5, I, 2010, p. 51. Lughatuna al-Jamila: al-Qawaid wa-l-Tadribat (Our Beautiful Language: Grammar and Grammatical Exercises), grade 7, II, 2002, p. 27. At-Tarbiya ad-Diniya al-Islamiya, grade 7, I, 2002, "Introduction"; idem, grade 7, I, 2010, "Introduction." Ibid., grade 8, II, 2002, "Introduction." Al-Ahram (Cairo), Apr. 27, 2010. Al-Misriya (Cairo), Apr. 29, 2010; al-Masri al-Youm (Cairo), May 3, 2010, in Inquiry & Analysis, no. 608, The Middle East Media Research Institute, Washington, D.C., May 7, 2010. Al-Misriya, Apr. 29, 2010, in Inquiry & Analysis, no. 608. Ibid., May 4, 2010, in Inquiry & Analysis, no. 608. Al-Jumhuriya (Cairo), Apr. 30, 2010, in Inquiry & Analysis, no. 608. Ibid., Apr. 28, 2010, in Inquiry & Analysis, no. 608. Al-Ahram, May 2, 2010, in Inquiry & Analysis, no. 608. At-Tarbiya ad-Diniya al-Islamiya, grade 8, part II, 2010, "Introduction." Ibid., grade 5, book 2, 2010, pp. 11-14. Ad-Dirasat al-Ijtimaiya: Jughrafiat al-Alam wa-Tarikh Misr al-Hadith, grade 9, part I, 2010, p. 136. The New York Times, Apr. 1, 2011. Art. 2 of the Egyptian constitution states that "Islam is the religion of the state and the Arabic language is its official language. The principles of Islamic law are the chief source of legislation." Raymond Ibrahim, "Egypt's Sisi: Islamic 'Thinking' is 'Antagonizing the Entire World,'" Islam Translated, Jan. 1, 1025. Al-Masri al-Youm, Sept. 25, 2011. See for example, the case of Coptic police general Emad Mikhail, the newly-appointed governor of the Qena province. Huge demonstrations forced the government to freeze the appointment. Al-Arabiya News Channel (Dubai), Apr. 25, 2011. In 2004, named the Center for Monitoring the Impact of Peace. For detailed list of schools, see Jews, Christians, War and Peace in Egyptian School Textbooks, Mar. 2004, pp. 167-71. Declaration of Principles on Tolerance, UNESCO, Nov. 1995; Integrated Framework for Action on Education for Peace, Human Rights and Democracy, idem, Nov. 1995; "Adopted recommendation concerning education for international understanding, cooperation and peace and education relating to human rights and fundamental freedoms," idem, Nov. 1974. Erneuerung in Der Koptisch–Orthodoxen Kirche, Ph.D. diss., University of Heidelberg, 1996, Studies on Oriental Church History, vol. 5, 1998. Related Topics: Egypt, Radical Islam | Yohanan Manor | Fall 2015 MEQ receive the latest by email: subscribe to the free mef mailing list This text may be reposted or forwarded so long as it is presented as an integral whole with complete and accurate information provided about its author, date, place of publication, and original URL.